Boccone Dolce (Papa Haydn's Copycat) - Let the Baking Begin! Boccone Dolce is a naturally gluten-free, light and crispy meringue dessert with just the right amount of zing from the berries. It is made with delicate, melt in your mouth meringue which is sandwiched with sweetened whipped cream & berries. The chocolate drizzle on each layer, definitely takes this cake over the top! Here in Portland most probably know this cake from Papa Haydn’s, a popular spot for delicious cakes and desserts. That is where I tried this cake for the first time and I have been hooked since! Boccone Dolce is Italian for – Sweet Mouthful and sweet mouthful it is! Back a couple of years ago when I visited the restaurant and then tried recreating this cake, there was only one or two recipes out there (online) and one of which called for 4 (!) egg whites for the entire cake. I didn’t need to make the cake to know that the recipe was not going to work. I am not sure why somebody would put out recipes that don’t work, but I tried making it with my own proportions and I think they work very well. What is a Boccone Dolce Cake? 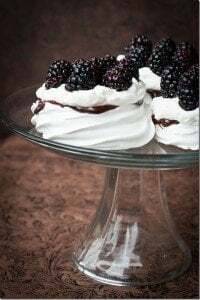 To those that are unfamiliar with the cake, it is made of light and airy meringue cake layers, then drizzled with dark chocolate, and all layered with fluffy Chantilly Cream before being loaded with berries. Just describing the cake makes my mouth water! Can I make Boccone Dolce as a sheet cake? I have been making this cake in a 1 layer, sheet cake (12″x16″) shape for all of our families get-together for years. If you’re wanting to serve this to a large crowd, 1 layer is the best. Not only is it more stable, but then you get more portions out of it too. Since the meringue layer is thick, you can prepare the cake the night before and it will hold up even the next day. No need to rush and assemble it hours before serving when making it as a sheet cake. If that is how you’d want to make it, follow the directions exactly, except where it says to lay it out on three, 9-inch circles, lay it out on one 12×18 upside down jelly roll pan. Bake time is the same. Side note, when making the cake in a sheet cake form, you can assemble it the day before. The meringue layer is very thick and it even benefits from a long stay in the fridge. In this case, go only with berries that you can use whole, – raspberries, blueberries, and blackberries work the best). This 12 inch round cake is made with a double portion of ingredients. Each layer consisting of 1 recipe. If you’re making the cake into 3 layers like pictured you need to start making it at least 24 hours before because the meringue layers need at least 9-12 hours to dry in the oven. Can the meringue be made ahead of time? When is the best time to assemble the Boccone Dolce Cake? The meringue is very delicate and absorbs the moisture from the cream fast. It is best to assemble the cake 4-6 hours before your intended serving time and make sure that you keep it refrigerated. It is essential for the cake to absorb some moisture because that is what makes the cake easier to cut. The cake that has been assembled right before serving will crumble and collapse as you try to cut it. The Boccone Dolce cake at the restaurant has a very minimal amount of fruit, but I load mine with a ton of berries. It is up to you how much you want to put and what kind of fruit you decide to include. 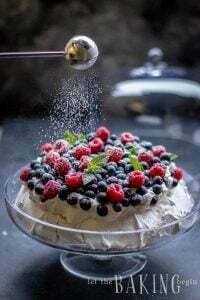 I like berries that do not need to be cut because they don’t release the juices and don’t color the Chantilly cream. Most of the time I go with raspberries, blueberries, and blackberries. I try to stay away from the strawberry, but if you do like strawberry it’s fine, just make sure to eat it the same day. 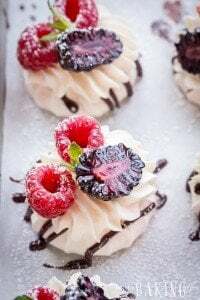 Meringue Baskets with Blackberries – These pretty little individually portioned meringue baskets can be filled with any fruits you would like, not just blackberries. Mini Boccone Dolce – Now if you’re into individual servings of Boccone Dolce, check these MINI Boccone Dolce’s. Turn the oven to 200 F.
Cut out 3, 9.5-10 inch circles from parchment paper. With a marker, draw a 8 – 8.5 inch circle in the middle of each piece of parchment. Turn the parchment over and place each parchment circle over 9 inch round pan, set aside (you can use layered aluminum foil if you don’t have 3, 9 inch round pans). Prepare a large pastry bag (or a gallon size zip-lock bag) fitted with a large star tip. Set aside. Take a small zip-lock bag, open it, drape the sides over a glass/cup. In a bowl of an electric mixer, fitted with a whip attachment, whip room temperature egg whites with cream of tartar/citric acid, starting with low speed and gradually increasing it as the egg whites begin to take shape and increase in volume. With the mixer still running and once the egg whites become white and foamy, start adding the sugar, one tablespoon at a time. Continue beating until stiff peaks form . Careful not to over whip, or you will have to start over. Over whipped meringue looks chunky and broken, whereas properly whipped meringue looks glossy and smooth. Fill the prepared pastry bag with meringue and in a swirl motion pipe the meringue inside the circles on the parchment paper. Place it on top of 9 inch baking pan bottoms, or upside down pans. Try not to get out of boundaries as the meringue will expand in the oven. Each circle should be about ¾- 1 inch in height, if your pastry tip is not large enough to make it that tall in one layer, just make another spiral layer on top. Place the pans in the 200F oven and dry for 10-12 hours. You can leave it in the oven overnight. The lower the temperature the whiter the meringue will be. If you can lower the oven to 180F, do so and extend the drying time. In a chilled bowl of an electric mixer, fitted with a chilled whip attachment whip start whipping cold heavy cream, going from lower to higher speeds as it thickens. Once the cream is somewhat fluffy, add the sugar and vanilla extract and again start with low speeds and all the way to the highest speed, until the heavy cream is whipped to stiff peaks. Place in the refrigerator until ready to use (not more then 30 minutes). Pour over chopped chocolate. Let sit for a minute or two and then mix with the spoon until smooth. Pour into the prepared zip-lock bag. Close the end and snip off the corner of the bag. Reserve 2 cups of frosting for decoration and place in the fridge. On a serving dish, put a dab of Chantilly Cream, place the first meringue layer and press gently to adhere. Spoon or pipe ¼ of the frosting on top of the meringue layer. Layer out the bananas and cover with ¼ of the frosting. Layer half of all the berries on top. Press them in gently. Place a couple of dabs of cream on top for the next meringue layer to adhere. Place the 2nd meringue layer and repeat with the fruits. Place the 3rd meringue layer (thinnest) and make 8 swirls all around the edge. Cut strawberries in half and place one half on each swirl, sliced side up. Place back in the fridge immediately, until serving time. Notes Make the cake at least 2-3 hours before serving, but not more then 6 hours before serving. Keep the cake in the fridge until it's almost time to serve. It's natural for the cream to separate if it stays at room temperature for too long. Meringue layers can be made up two 2 days in advance, but must be kept in an airtight container (wrapped in shrink wrap), to prevent moisture from being absorbed by the meringue. If the cake must be transported, let the cake sit in the fridge for 2-3 hours before doing so, otherwise the layers will start going separate ways, or the cake will crack and ooze to sides. 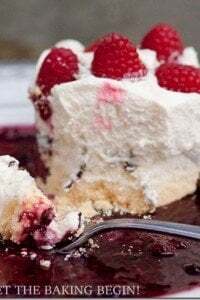 Pavlova Cake Recipe - Red, White and Blue Dessert - Let the Baking Begin! I wanted to know, do you have any pictures of this cake in the single layer rectangular shape? I really want to try it but love to see things visually first. 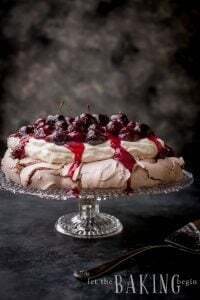 Cherry Chocolate Pavlova Recipe - Meringue Dessert Cake - Let the Baking Begin! Mini Boccone Dolce - Let the Baking Begin! Let the Baking Begin! How long do you let it actually bake for?? I noticed you said to leave it to dry in oven for about 10 to 12 hours but is that with the oven on or with it off?? The 10-12 hours is the actual baking time, or drying time. With the temperature being as low as the direction say, the meringue doesn’t burn, but slowly dries out. Does it really take 10-12 hours to bake? I’ve seen similar instructions, but with only 3-5 hours of baking time. Does the longer time only effect the color of the cake? The cake is ready when it’s dry on the inside. So if your cake layers take only 3-5 hours to be dry on the inside then that’s all you will need. But for me it usually takes 8-12 hours for it to be dry. I think I mentioned in the instructions that I leave the cake to bake in the oven overnight. So if I put it in the oven at 10 pm, I get it out of the oven the next morning around 8 am. If you go past the time when the cake is dry on the inside, or if you put the oven temperature up then the color will be darker. Thank you for posting this! Do you leave the oven off for 12 hours to bake? Nope, the oven needs to be on. So this cake is supposed to turn about 8 inches in diameter based on the parchment paper instructions? I got a little confused with why you need to first cut out a 9.5-10 inch circle??? Please explain. Thank you! Hi Yelena, thank you for your question. This recipe makes a 9 inch cake (or slightly bigger), but you need to draw an 8 inch circle and then spread the meringue to the edges of the 8 inch circle. Once the meringue is baked, it expands and it will become a 9-10 inch cake layer. Thank you Marina for ur hard work!!! We do appreciate it!!! I want to make one layer cake!!! How long do I keep it in the oven? Same time and temp? And for decor cream should I make helf of it? Thank you!!! I am planning on making a rectangular cake like you were mentioning. I have a question about the pan in which to bake the meringue. Does it have to be a deeper pan or can I use a cookie sheet? I am thinking a cooking sheet won’t work because it is not as deep, right? Also, for a one layer rectangular cake when I assemble the cake would I just have the meringue layer, layer of cream, and fruit on top? Would that be the assembling pattern? Please let me know, thanks! You can totally use the cookie sheet, the meringue will not go anywhere, the pan can be flat and does not need to be deep. When you make a one layer cake you put meringue, drizzle chocolate, put cream on top and then fruits and again a drizzle of chocolate. Also, for 1 sheet cake, make sure to assemble it at least 10 hours before you plan to serve it, this way the meringue layer will not be too hard. Could I use some fresh juice of a lemon instead of 1/4tsp. cream of tartar or citric acid as I don’t have any on hand!? Yes you can. Just use about 1 teaspoon of lemon juice. For the chanitally cream, do you use regular sugar or powder sugar? And a cup of sugar for 4 cups of heavy whip cream, correct? Hi Olga, I apologize for such a late reply. I use regular sugar. So yes it is 4 cups of heavy cream and 1 cup of sugar. Hi i was wondering if in step 10 when you say “dry out” for 10-12 hours do you mean cook them on 180 for 10-12 hours ? thanks! also, can i make these on a cookie sheet or will the expand too much ? Yes, drying out, means to bake them at 200F for 10-12 hours. As I said in the post, I leave them overnight in the oven. Hi, Marina, I was wandering how long do you bake the meringue for before turning the oven off and letting it dry?! I had trouble baking the meringue!!! Hi Michelle, As it says in step 10, you dry it for 10-12 hours and then turn the oven off and allow the meringue to cool (not dry) in the oven, with the door slightly ajar. The only way you would have trouble with meringue is if you did over whipped the meringue, under whipped the meringue, or did not dry it for enough time. Hope this helps. This looks amazing for valentines day but how do I scale it down for just my hubbie and I and not 35 servings!!!! Well 35 servings, that is sensible portions, meaning they are pretty small. If you want to scale it down, just make 1/4 of the recipe. Divide all the amounts by 4 and instead of making a 3 layer cake, pipe out 2 individual meringue disks, about 3-4 inches in diameter), or one 8 inch round cake that you will split between the two of you. If you do make only make 2 smaller disks, the drying time will be significantly decreased (may be to 4-6 hours, instead of 9-12). Also if your oven temperature goes down to 150F, dry it at 150F and increase the drying time, this will give you very white meringue (which is esthetically more appealing to the eye). Am I the only one who noticed the cream portion of the recipe was just a replication of the meringue? I would really like the whole recipe. Thank you. Good eye Cheryl! I think when I was editing the recipe I pasted the wrong part by mistake. I made the corrections to the recipe. Thank you, Marina! I am a fairly avid baker. Heck I’ve even masters full on 21+ cup cakes. 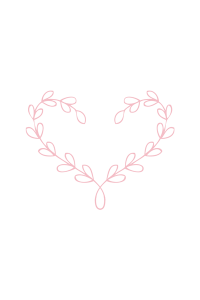 But I love to appreciate others approaches and try new things. Thank you again. Wow what a beautiful cake! I’m sure it tastes just as good as it looks!